I am a cradle Catholic, and completely feed into the stereotype: I'm not really handy with the bible. I'm not good with verses and reading when there are numbers thrown in after every sentence. 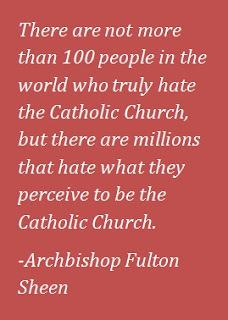 I want to read the bible more, but thankfully the Catholic Church has many ways for me to learn about my faith. This caveat noted, if my research is accurate, this verse is where the "be in this world but not of it" mantra originated. I like the verse in this (NABRE) translation. It clarifies some things for me. We do not belong to this world. It is wonderful to be reminded that this is not the end of the road. 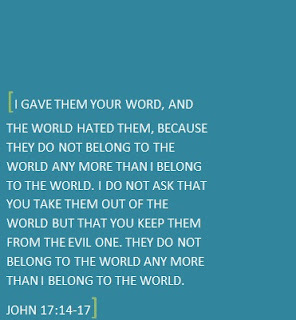 However, sometimes it seems that folks feel they must make the world hate them to follow Christ. 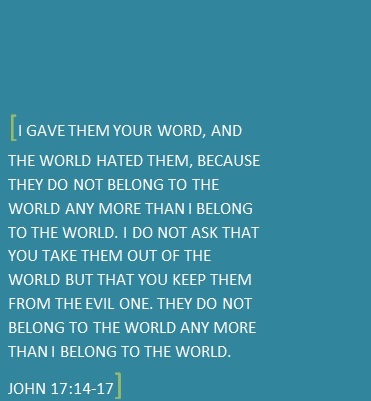 Often times we are the ones misrepresenting Christ and His teachings. We put an emphasis on truth telling and tough love, but babies born to couples that are not married have trouble getting baptized. People that are divorced are shunned in their parish. People seeking desperately to be close to Christ through the Eucharist are asked not to attend Mass because they identify as homosexual. People that feel so unloved and so uncomfortable in their own skin that they want to be a different gender all together are compared to whores in the blogosphere. So I ask, if this is tough love, where is the love? I get it. Sometimes the most loving thing you can do is tell the truth, even when it is hard. There is no love in rejecting a person while you are engaged in your truth telling. You can reject the sin, but how are you embracing the sinner? 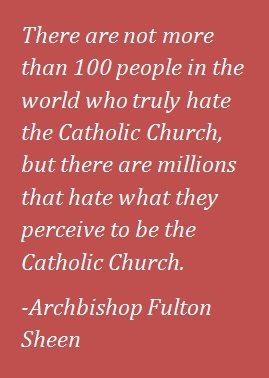 I have known some incredible Catholics in my lifetime. Give you the clothes off their backs type of people. I have known many priests that are good and holy men. So nothing makes me crazier than Catholics making all Catholics look like cruel jerks. Know the truth. Learn why the Church teaches what she teaches. Soak up information. Then take a class on interpersonal relationships and learn how to love people. One is not more important than the other. And for the love of all that is good and holy and true: stop using intentionally sexist and derogatory terms to describe someone when you do not like their actions. *I keep running into a few versions of this quote. Not sure which is correct, but if you know where it comes from, message me and I will figure it out!